This perfectly-carved limestone arc just west of Lulworth is perhaps one of the most beautiful naturally-forming rocks in the country. The land and surrounding waters have been subject to endless works of art, including paintings, photographs and prints, as well as starring in music videos, movies and literature. With a view like this, it's not hard to see why! 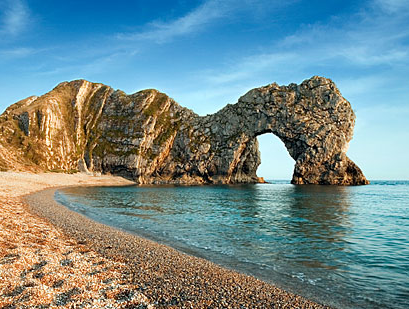 "Durdle Door and Man ‘O’ War beaches are part of the Lulworth Estate. Shingle beaches which are only accessible on foot via a steep path and steps over the hill from Lulworth Cove or down from Durdle Door Car Park (located on the cliff top at the end of Durdle Door Holiday Park.). Parking is available all year with Pay & Display parking (7am – 10pm peak) (10am – 4pm off peak). Both bathing beaches are recommended by the Marine Conservation Society for excellent water quality. Please be aware they shelve steeply in places and to supervise your children at all times. Dogs are allowed. A shop and toilets (including facilities for disabled people) can be..."
The form of the coastline around Durdle Door is controlled by its geology—both by the contrasting hardnesses of the rocks, and by the local patterns of faults and folds. The arch has formed on a concordant coastline where bands of rock run parallel to the shoreline. The rock strata are almost vertical, and the bands of rock are quite narrow. Originally a band of resistant Portland limestone ran along the shore, the same band that appears one mile along the coast forming the narrow entrance to Lulworth Cove. Behind this is a 120-metre (390 ft) band of weaker, easily eroded rocks, and behind this is a stronger and much thicker band of chalk, which forms the Purbeck Hills. These steeply dipping rocks are part of the geological structure known as the Lulworth crumple, itself part of a broader monocline (a kinked type of geological fold) produced by the building of the Alps during the mid-Cenozoic. The limestone and chalk are in closer proximity at Durdle Door than at Swanage, 10 miles (16 km) to the east, where the distance is over 2 miles (3 km). There are at least three reasons for this. Firstly, the beds are highly inclined (whilst more gently inclined at Swanage). Secondly, some of the beds have been cut out by faulting; and thirdly, the area around Durdle Door seems to have had shallower water at the time of deposition than comparable geological sections, so thinner bands of sediments were deposited. Around this part of the coast nearly all of the limestone has been removed by sea erosion, whilst the remainder forms the small headland which includes the arch. Erosion at the western end of the limestone band has resulted in the arch formation. UNESCO teams monitor the condition of both the arch and adjacent beach. The 120-metre (390 ft) isthmus which joins the limestone to the chalk is made of a 50-metre (160 ft) band of Portland limestone, a narrow and compressed band of Cretaceous Wealden clays and sands, and then narrow bands of Greensand and sandstone. In Man O' War Bay, the small bay immediately east of Durdle Door, the band of Portland and Purbeck limestone has not been entirely eroded away, and is visible above the waves as Man O'War Rocks. Similarly, offshore to the west, the eroded limestone outcrop forms a line of small rocky islets called (from east to west) The Bull, The Blind Cow, The Cow, and The Calf. As the coastline in this area is generally an eroding landscape, the cliffs are subject to occasional rockfalls and landslides; a particularly large slide occurred just to the east of Durdle Door in April 2013, resulting in destruction of part of the South West Coast Path. Go and visit Durdle Door and then come and pop into taste* Chesil for lunch or afternoon tea. Or why not start the day off with a taste* chesil breakfast and then go explore Weymouth and Portland. Find our more about Durdle Door here.